Event starts 2019/04/27 8:00 AM. Get notified when the pictures are ready. All Photos from this event are Freeeeeee! You have 7 days, 14 hours, 43 minutes and 1 seconds left before the race starts!! Event starts 2019/05/04 7:30 AM. You have 14 days, 14 hours, 13 minutes and 1 seconds left before the race starts!! Event starts 2019/05/04 8:00 AM. You have 14 days, 14 hours, 43 minutes and 1 seconds left before the race starts!! Event starts 2019/05/11 8:00 AM. You have 21 days, 14 hours, 43 minutes and 1 seconds left before the race starts!! Event starts 2019/05/13 8:00 AM. You have 23 days, 14 hours, 43 minutes and 1 seconds left before the race starts!! Event starts 2019/05/18 8:00 AM. You have 28 days, 14 hours, 43 minutes and 1 seconds left before the race starts!! Event starts 2019/06/01 8:00 AM. You have 42 days, 14 hours, 43 minutes and 1 seconds left before the race starts!! Event starts 2019/06/01 9:00 AM. You have 42 days, 15 hours, 43 minutes and 1 seconds left before the race starts!! Event starts 2019/06/02 8:00 AM. You have 43 days, 14 hours, 43 minutes and 1 seconds left before the race starts!! Event starts 2019/06/08 8:00 AM. You have 49 days, 14 hours, 43 minutes and 1 seconds left before the race starts!! Event starts 2019/06/09 7:00 AM. 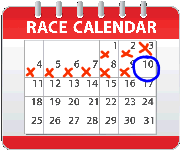 You have 50 days, 13 hours, 43 minutes and 1 seconds left before the race starts!! Event starts 2019/06/15 7:00 AM. The inaugural Speedway Spin fundraising event will be held exclusively on the grounds of Atlanta's NASCAR track, Atlanta Motor Speedway benefiting Children's Healthcare of Atlanta. Children's is one of the largest children's hospitals in the country serving Atlanta, Georgia and the southeast with more than one million patient visits annually. This fun-filled event will feature a Metric Century, and festival atmosphere inside the oval race track. You have 56 days, 13 hours, 43 minutes and 1 seconds left before the race starts!! Event starts 2019/06/16 7:30 AM. You have 57 days, 14 hours, 13 minutes and 1 seconds left before the race starts!! Event starts 2019/07/13 8:00 AM. You have 84 days, 14 hours, 43 minutes and 1 seconds left before the race starts!! Event starts 2019/07/13 8:30 PM. You have 85 days, 3 hours, 13 minutes and 1 seconds left before the race starts!! Event starts 2019/08/10 8:00 AM. You have 112 days, 14 hours, 43 minutes and 1 seconds left before the race starts!! Event starts 2019/08/24 7:30 AM. You have 126 days, 14 hours, 13 minutes and 1 seconds left before the race starts!! Event starts 2019/09/07 7:00 PM. You have 141 days, 1 hours, 43 minutes and 1 seconds left before the race starts!! Event starts 2019/09/13 5:00 PM. You have 146 days, 23 hours, 43 minutes and 1 seconds left before the race starts!! Event starts 2019/09/14 8:00 AM. You have 147 days, 14 hours, 43 minutes and 1 seconds left before the race starts!! Event starts 2019/09/15 9:00 AM. You have 148 days, 15 hours, 43 minutes and 1 seconds left before the race starts!! Event starts 2019/09/29 8:00 AM. You have 162 days, 14 hours, 43 minutes and 1 seconds left before the race starts!! Event starts 2019/10/11 6:00 PM. You have 175 days, 0 hours, 43 minutes and 1 seconds left before the race starts!! Event starts 2019/10/12 7:30 AM. You have 175 days, 14 hours, 13 minutes and 1 seconds left before the race starts!! Event starts 2019/10/20 8:00 AM. You have 183 days, 14 hours, 43 minutes and 1 seconds left before the race starts!! Event starts 2019/10/26 8:00 AM. You have 189 days, 14 hours, 43 minutes and 1 seconds left before the race starts!! Event starts 2019/10/26 6:00 PM. You have 190 days, 0 hours, 43 minutes and 1 seconds left before the race starts!! Event starts 2019/11/02 9:30 AM. 8th Annual RUN for your LUNGS! Jackie's Run for Life @ Lake Blackshear Resort in Cordele GA! This is a Run & See GA Grand Prix Series Event, and raises awareness for the deadliest cancer of all cancers, Lung Cancer. You have 196 days, 16 hours, 13 minutes and 1 seconds left before the race starts!! Event starts 2019/11/03 1:00 AM. Anything is Possible 5K 2014 - VIP photos! You have 197 days, 8 hours, 43 minutes and 1 seconds left before the race starts!! Event starts 2019/11/09 7:00 AM. You have 203 days, 14 hours, 43 minutes and 1 seconds left before the race starts!! Event starts 2019/12/15 8:00 AM. You have 239 days, 15 hours, 43 minutes and 1 seconds left before the race starts!! Stamp Out Poverty 5K Run 2019 ~ Inside Zoo Atlanta!